Musings on rationality, Judaism, beauty, and the importance of an examined life. Does Online Training Lead to More Sales? When last we left “Mr. 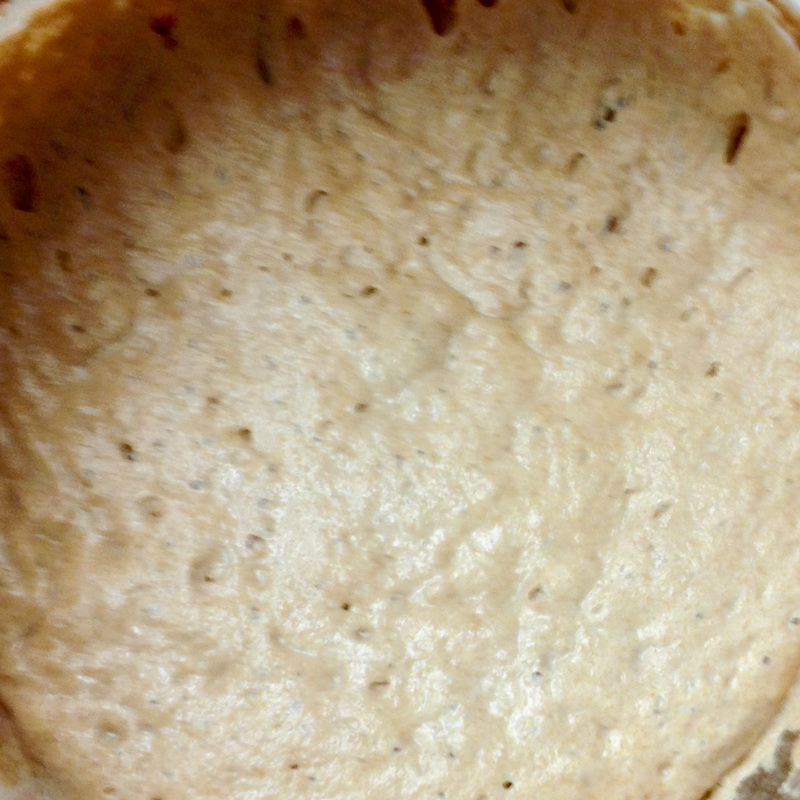 Blob” he has helped us to create a Pain de Campagne that I’m pretty proud of. The problem is that he needs daily feeding. Unfortunately, I need to lose weight, not to gain it, so I simply can’t bake bread every day. On top of that, I kind of owe the nice people who pay me for my broadcast expertise 50 or 60 hours of my time every week and who am I to piss off the boss. So, what can I do with my pet blob to make everyone happy? First, after you’ve made a bread (or just decided that you are burned out on baking; or stood on the damn scale and know exactly what happened to your once shapely bod; or, whatever) grab your levain bucket, scale, and a unperforated ziplock bag. 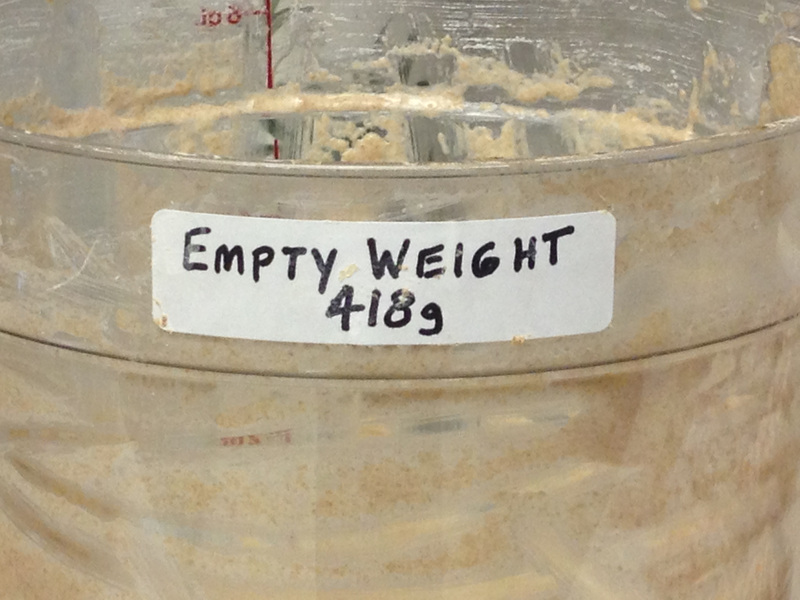 Weigh out 300 grams of levain, toss it in the bag, zip it up, and label it with the date. This last part is important because it will only store in the fridge for around a month, max. If you find it 6 months later, ya ain’t got culture anymore – all ya got is a dead blob. So date it and do what I say at least once a month. 24 hours or so later, just like when we first grew Mr. Blob, our high-culture dough Golem – lo and behold! It has grown back up to its old self; bubbly, frothy, and right around 2.5 – 3 liters. I was pretty darn excited when it worked, to be honest. But, ta da!!! Here he is. A quick look from above reveals a beautiful sponge just like the original culture. All of that was just “day 1”; but I said you needed 2 days. On the morning of day 2, feed the levain just like you do with any other daily feeding: keep 100g, throw away the rest; add 100 g wheat and 400 g white flour; mix in 400 g of 95 degree water; stir; cover; store. Seven or 8 hours later, you are all set to bake! A couple of times in the past year I’ve taken the opportunity to share my newly found love of bread making. This, you know well, is thanks almost entirely to my new friend Ken Forkish, his perfect baguettes, and his James Beard Award winning book “Flour, Water, Salt, Yeast” ( ISBN 978-1607742739 – Ten Speed Press – http://amzn.com/160774273X). Here is a post to add to the collection! Having become relatively competent in terms of making dough with commercial yeast, and having expanded my complexity to include Poolish and Biga, I decided it was time to take the plunge and to dive into Levain. I’d like to share the experience with you in the hope that you’ll be inspired to try your own culture. So, here goes. (by the way, to avoid infringing on Mr. Forkish’s copyright, I’m not going to give you the exact recipe or the exact process and all the photos below are of my own Levain culture, taken in my own kitchen, with my own iPhone. What specifics? Buy the book. It’s worth it). 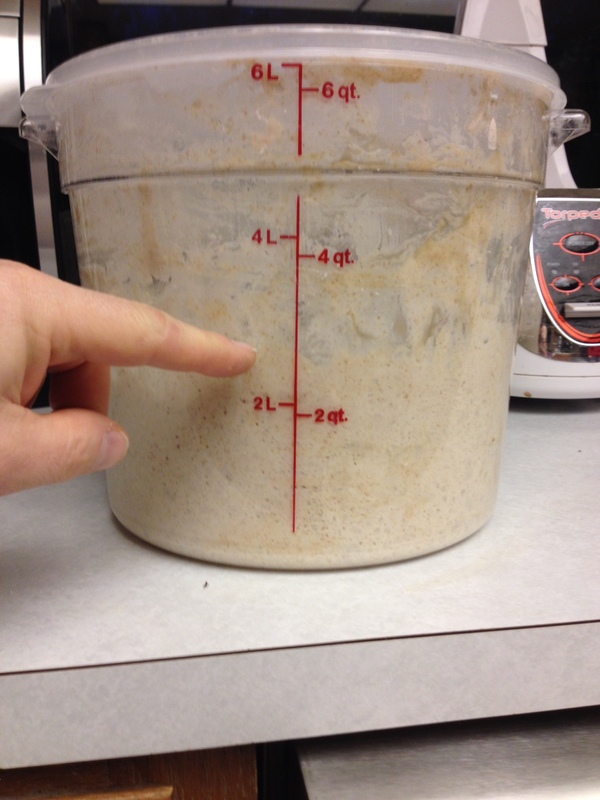 It takes about 5 days to grow a mature Levain culture. What blew me away was not how easy it was (which it was) but how much flour you throw out. It also completely astonished me to see how little mature Levain is required to create a very cool result. Basically, you just start with flour and water. 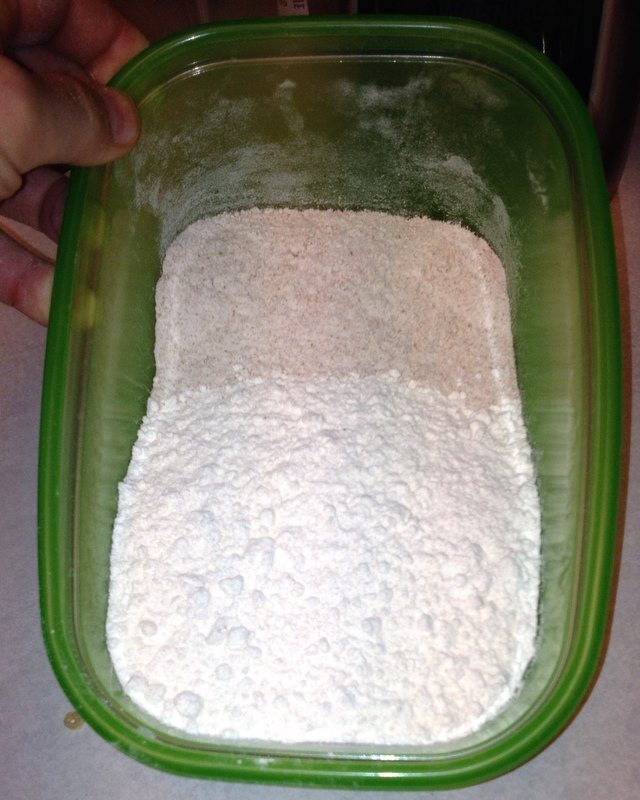 Every day you throw most of it away and add more flour and water. After the first day, little has happened. 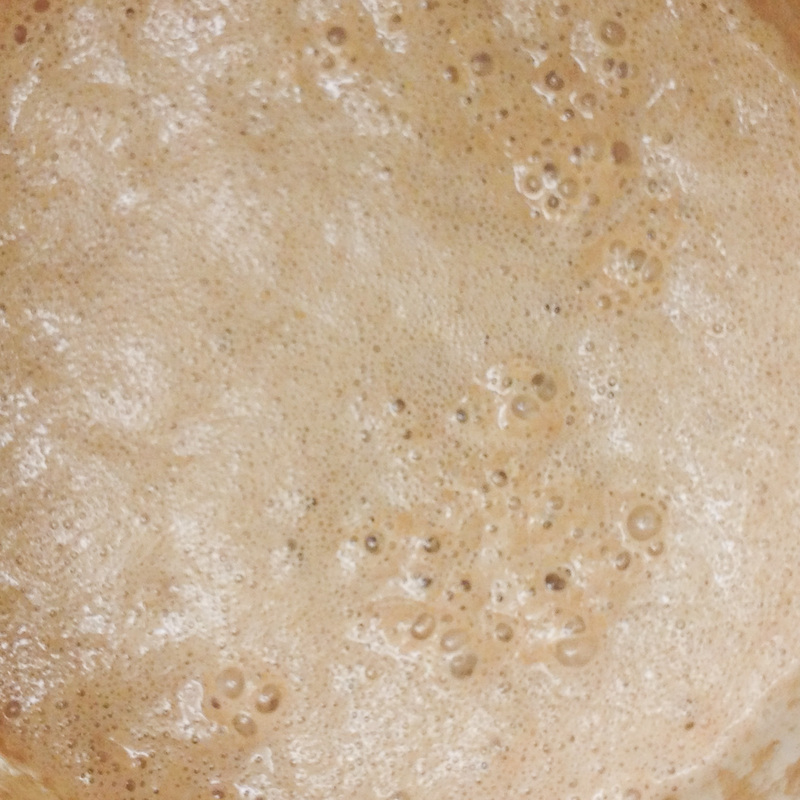 But by day 4 it is a really beautiful leathery, alcohol(ish), bubbly sponge. By day 5 it just grows and grows. By that time you either use it daily or you throw the majority of it away and just hold back 100 grams to keep the culture growing. So, to keep your culture alive you take a few minutes every morning to throw most of the Levain away and to add another 500 g of flour and 400 g of water. That’s a lot of wasted flour. But, to watch the culture expand each day is really amazing. 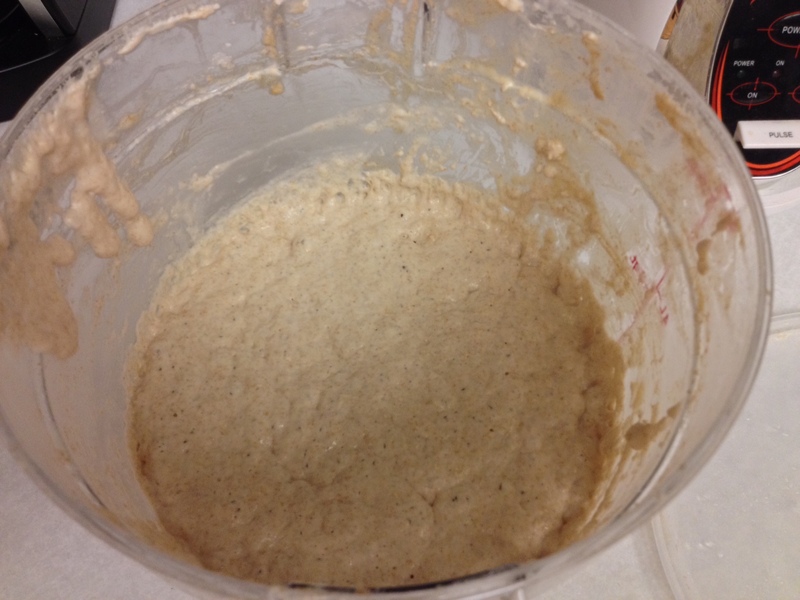 At the end of day 1 the Levain looks like plain ol’ dough. Not all that exciting. But remember, it did rise all by itself just based on the natural flora in the wheat. That, in itself, is cool. Here is what it looked like after about 26 hours. (SUPER CRITICAL NOTE: Look! It rose! It did NOT need any commercial yeast to get it started. Take that as day 1’s most crucial lesson” YOU DO NOT NEED ANY COMMERCIAL YEAST TO GET IT STARTED. In fact, even adding a fraction of a gram of commercial yeast will ultimately ruin it because commercial yeast is far more vigorous. It would be like planting some nice weeds to help your petunias get started. DON”T DO IT). 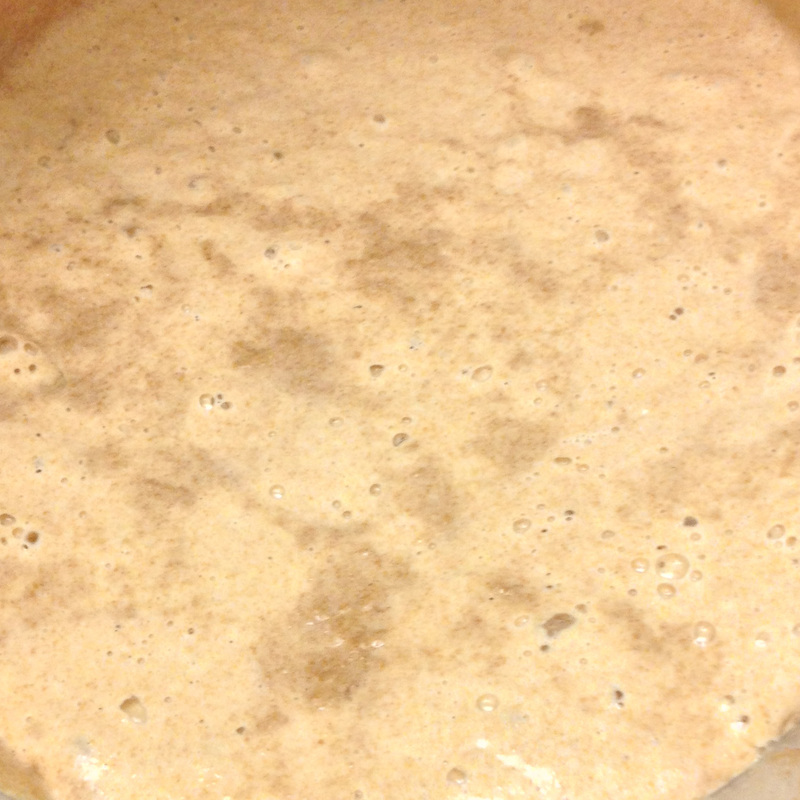 Look down into the tub and, even at the end of day 1 you will see some nice bubbles forming. By day 2 it is starting to look a bit different. it has more bubbles and the texture changes to a little more of a “sponge”. Until they add the “smell-o-vision” feature to WordPress I’m sorry to say you won’t get to experience the real change unless you do this yourself. But, by day 2 it has a relatively pronounced leathery and almost pungent aroma. Here it is on day 2. On day 3, the mixture is almost like a slurry. The aroma is very strong. Keep throwing stuff away, it keeps growing back! Kind of like “The Blob” but without Steve McQueen 🙂 In my day 3 picture here, you can see a lot of color fluctuations. This is not the result of the process. You see, for the first couple days, after tossing some of the culture and adding new flour and water you are supposed to let it sit uncovered for an hour or two. (I THINK that is to expose it to some ambient airborne yeasts but I really haven’t got a clue – if you know why, comment on this post and let us all in on it!). In this picture, I’m sharing my one mistake. I left the house without covering it and left it uncovered for 4 or 5 hours. You can see the areas that dried out. That said, big deal. It certainly did not stop “Mr. Blob” from growing! (For that, Steve McQueen needs to dump the beast into the arctic ocean, or something). Here is Day 3. Then everything else will be easy. Zero your scale and put your tub on it. 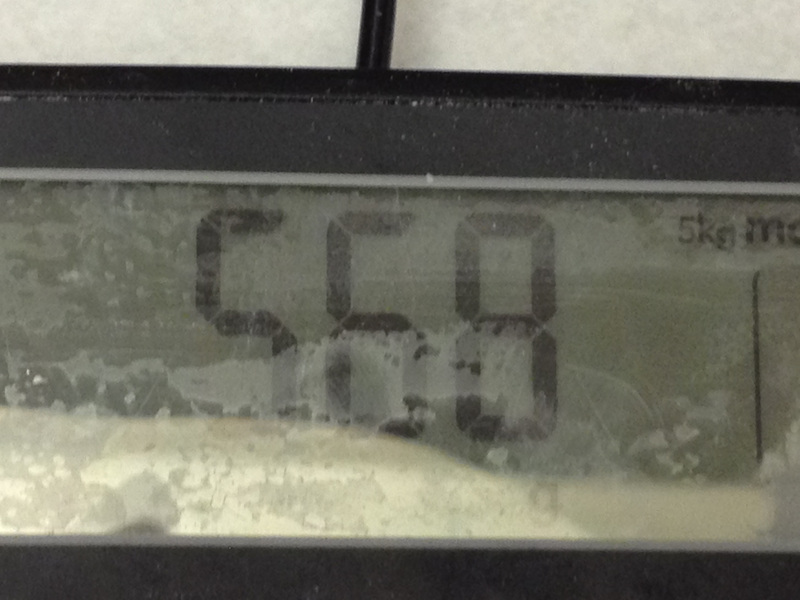 Then just start throwing away Levain until the scale reads 150 grams more than the tub weight. See…. 568 minus 418 is, you guessed it: 150!!! Here’s my day 4 culture. That little 150 grams of sponge grew up (again!). 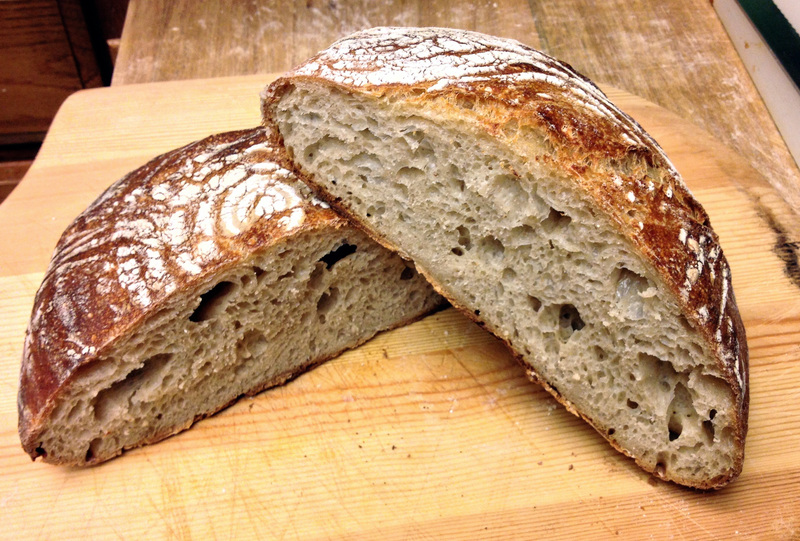 You can begin baking bread, using your amazing new Levain, on day 5. 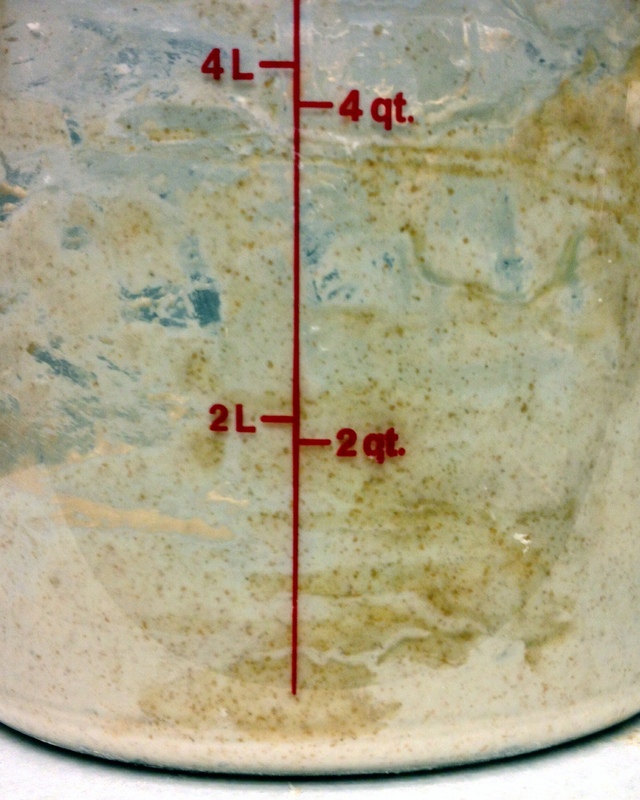 Here is a photo of the ready to use 4+ day old culture. It almost has the consistency of sticky, thick, stretchy pancake batter. It has a strong aroma and, to my nose at least, it smells of alcohol, leather, yeast, and wheat fields. That description does not really do it justice because it actually smells a hell of a lot better than that. In any case, it’s awfully cool if you’re a bread loving foodie like I am. The next thing you need to remember is that once you’ve grown your culture you have to keep it alive. You can sort of think of it as your new pet, Mr. Blob. Every morning, like feeding the dog, you need to feed your Levain. This means tossing most of it away, as should now be unsurprising. Seriously, it’s hard to do. You need to throw everything in the trash except for a paltry 100 grams. Believe me, when you look at a tub with only 100 grams of Levain it looks almost like you dumped it all and just forgot to scrape the bowl. It will barely coat the bottom of the tub and you will think that Mr. Blob is dead. But don’t be fooled! The morning Levain feeding is really very simple. 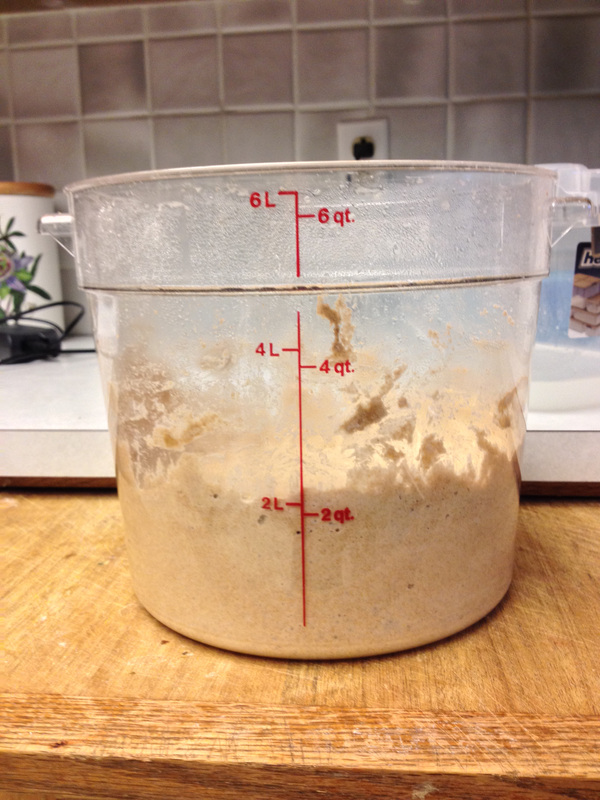 Reserve 100 g of the Levain in your tub, To it add 500 g of flour (I use 400 g white and 100 g brown but that’s just how Ken Forkish tells me to – you may have your own ideas for substitutions). Then add 400 g of water at 85 – 90 degrees Fahrenheit, mix it by hand until it’s just incorporated, and toss it back on the shelf. 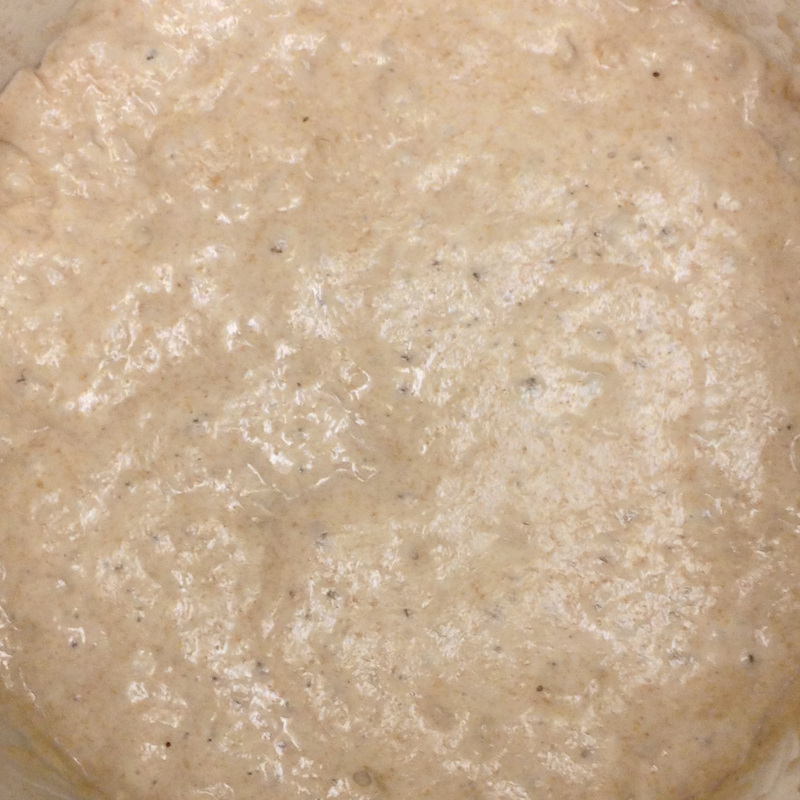 Seven or eight hours later your Levain will be back up to it’s good old aromatic, bubbly self and you can use it in your breads any time between then and the next day’s feeding. If you don’t use it for 24 hours, feed it again. If you don’t want to feed it daily, take about 300 g of the Levain, put it in a nonperforated plastic bag, and store it for up to a month in the fridge. Because I’m a traditional French bread freak, I wanted to start using my Levain in a traditional French bread. I chose Pain de Compagne because it’s chewy, crusty, and relatively complex. It also uses both Levain and a bit of commercial yeast so you don’t have to wait 12 or more hours for it to bulk ferment. So….. FANFARE…. Here is my first Pain de Compagne. Check ‘er out! Notice those perfect holes, the lovely color, the relatively thin but wonderfully crisp crust, and the nice shiny crumb. No, I’m definitely not a bread guru. But, this is a pretty darn good result for an amateur 🙂 If I can do it, you can do it. So give it a try! Love to hear your thoughts, advice, and experiences. Feel free to comment! By the way, here’s to a 2014 of some great new culture! Happy New Year.